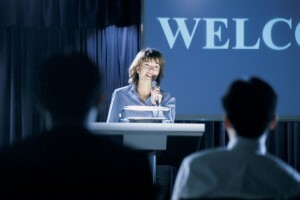 Narrating PowerPoint Presentations designed by someone else can be very challenging. In fact, one of the fastest ways to increase public speaking fear and make your PowerPoint presentations sound canned and… well boring, is to try to deliver a PowerPoint slideshow that someone else designed for you. This doesn’t mean that you can’t deliver PowerPoint slide decks that someone else created. It just means that when you do, you’ll probably be more nervous and have less of a natural flow than what you’d normally have when you stand up and deliver a speech. Remember that a presentation or a speech is just a conversation with your audience, so if you create the speech, you’ll be speaking in your own words. When someone else creates a speech for you, you will feel more uncomfortable and the public speaking nervousness will increase. If you remember the movie Roxanne or the play about Cyrano de Bergerac, the two male characters, Christian and Cyrano are both in love with Roxanne, but Christian sees himself as being inarticulate and Cyrano sees himself as being ugly. Christian gets Cyrano to write love letters for him, which works pretty well until Roxanne finds out who actually wrote them. In the movies, Christian is portrayed as a dunce, but according to the original play, Christian is a brave and intelligent warrior who is just nervous. Christian is the kind of person that Roxanne would have fallen in love with if he had just used his own words to woo her. But because he was using Cyrano’s verbiage (his slideshow,) it just made Christian even more nervous – not less. Roxanne never got to know the real Christian. Your audiences are the same way. You will feel much more confident if you can communicate your own words to your audience versus trying to manufacture the “right thing to say” about a PowerPoint slide or bullet points that someone else created. With that in mind, we know that situations will occur where we have no control over the PowerPoint slideshow or any of the visuals really. For instance, if you are a sales associate, and your company requires that you use a standardized PowerPoint presentation when you speak to customers or if someone calls in sick and you have to fill in for them at the last minute, the tips below will help you out tremendously. Add Your Own Personal Experiences: The main thing that sets one presenter apart from another is the personal examples or stories that they tell when they deliver a presentation. You can easily make your PowerPoint presentation your own by inserting stories and examples from your own experience into the speech. For example, let’s assume your bullet point is “Sales decreased by 10% last quarter,” you’ll want to first clarify the point and explain in more detail what it means. For instance you might show the total number of “call-in” leads that the sales team received in the quarter versus previous quarter. Then once you have explained the point, add a personal experience to further explain it. “A couple of years ago, when I was a sales rep, I remember days that as soon as I would set the receiver down, another new incoming call was already being routed to me. The guys who are on duty now, however, are averaging ten to fifteen minutes between each call. At first, we thought that the time between calls was wasted time, so we looked at downsizing the sales team. However, because each salesperson is able to follow up better with each incoming lead, their closing rations have increased over 250%. So that 10% decrease in sales is coming from less than half the number of incoming leads that we were receiving in the boom.” Without the personal story, the bullet looks like the sales team is failing, but in reality, they are doing a tremendous job with the resources that they have had. Avoid Memorizing Someone Else’s Notes: If you try to write down everything that someone else tells you to say and memorize it, you will increase your nervousness exponentially. Instead, go to each bullet point and ask yourself, “What is the most important thing that the audience would need to know about that point?” Whatever pops into your head when you ask that question will likely be exactly what the audience needs to know. If you use this technique, then if you forget what you have prepared while you are speaking, you can just, internally, ask yourself the question again, and your answer is likely to return pretty easily. You May not Need to Speak to Every Point: When other people write a PowerPoint presentation for you, they often will insert way too much data into each slide. As a result, it can be very challenging to speak to every point. Realize that, as the presenter, you are in control of what you say. I had a client once whose executives decided that they wanted to create one all-encompassing slideshow that any sales rep could use in any situation. The finished PowerPoint deck had over 120 slides. There is no way that any presenter could deliver that much data in so short a period of time. So what my client did was print out the whole deck and had an office supply store put a cover on it. She gave this out to the clients as a reference and hand-picked the slides that were most appropriate to each client at the time she presented. As a result, she didn’t bore any of them. So sometimes, you might have to get a little creative in your delivery. Remember that narrating a PowerPoint slideshow that someone else creates for you is definitely more challenging than delivering a presentation that you create on your own, however it can be done. Just be sure to make the PowerPoint your own by inserting your own personal stories and experiences into the slides, spend time determining exactly what is most important to the audience, and feel free to cut out some of the bullets if your presentation is too data heavy. If you follow these simple tips, you will be more charismatic and articulate when you narrate someone else’s PowerPoint presentation. Doug Staneart is the founder and CEO of The Leader’s Institute® public speaking training and leadership coaching institute. His first book, Fearless Presentations is available on Amazon and Kindle. He offers hundreds of different public speaking tips on his website at https://www.fearlesspresentations.com and to his followers on Facebook.